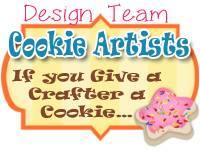 I am so excited to be a new member of the Design Team for If You Give a Crafter a Cookie. They began in 2014 and have 2 challenges each month. Each challenge is based on a picture of cookies, which intrigued me right away !! I hope that some of my creative friends will link a project up to their blog. There are prizes each month from some great sponsors !! Here is the picture for Cookie Challenge #85, which runs from Jan. 11-24. I hope you like what I've come up with and also take a look at what my team-mates created. We were just in the path of Winter Storm Grayson, so I wanted to make a bright, cheery card. I got out my new Distress Crayons and a fun Unity stamp and this is what I came up with !! I stamped Lauren from Unity Stamp Company twice; once on Neenah Stardust White Cardstock and once on a piece of word-patterned paper with my favorite Memories India Black Ink. The shirt, pants and flower/leaves were then fussy-cut separately from the word-patterned image. I then colored these fussy-cut flower/leaves and pants with Distress Crayons. The color was applied to each piece, then blended with my finger, adding more color as needed. This was SO much fun to do -- now I need more colors !! The intact stamped image of the girl was colored with a combo of my favorite Distress Markers and Faber-Castell PITT Artist Pens and some glitter pens; then adhered to a bright green card base at an angle. THANKS was applied with some Prima Marketing canvas letters from my stash. See, it pays to buy those letters at Tuesday Morning even when you don't have a clue what you will be doing with them !! A strip of grass washi was placed along the bottom of the stamped image. I have to give a shout-out to Echo Noble, an amazing stamper/papercrafter who inspired ths card . I saw her video using this Distress Crayons technique with this stamp and I was hooked !! 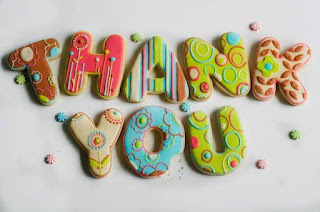 Thank you for visiting Meticulosity and taking a look at my first Cookie Challenge !! I hope that some of you will link up a fun THANK YOU project -- each Challenge runs for 2 weeks. The prize for this Challenge will be a ribbon sampler to use in your future creations. I'm excited to be on this team and can't wait for Challenge # 86.
the detail! thanks for sharing your process! and washi grass?! I NEED that!!! I have to repeat whta phinner said....washi grass??? I need that!! LOL Love your card and your take on the cookies. Great job.